June begun for us very interestingly. We carried out a workshop within the Nordplus project "Experiences of Sustainable Building" about natural plasters on 4-5 June in The Natural Building Company who is our good cooperation partner in Finland. We introduced lime and clay plasters, filling and finishing layers, different plastering techniques and waterproof plastering technique tadelakt. All in practice and in theory. The workshop based on our own decorative plaster mixtures: red and brown clay plaster with hemp fiber, lime plaster with hemp fiber, sand plaster, paper plaster, tadelakt plaster mixture. There were 16 participants in the workshop, mainly professional builders and self-builders. 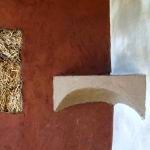 The practical part was carried out in an example straw-bale house built by The Natural Building Company, where we finished the walls with different plasters. Tadelakt was made on example boards and on the walls of the example house. What a pleasant weekend it was! The workshop was a productive beginning for an efficient cooperation. Thank you, Natural Building Company - thank you, Paul, Charlie and Kasper!